3 Comments on Apocalypto: Why Don’t We Look Away? I have a confession to make. I chose to analyse Apocalypto for my WCT (Writing & Critical Thinking) module simply because I needed an excuse to watch this rip-roaring adventure, which made huge waves when it was first released in 2006. In my WCT paper, I was obliged to give as objective a critique as I could…Here, though, I write my opinion. Mel Gibson’s film tells the story of a Mesoamerican forest-dwelling tribesman, Jaguar Paw, who escapes capture and human sacrifice by the Maya people, and then subsequently (and satisfyingly) turns upon and takes down his pursuers one by one. The movie has received generally positive reviews, with approval ratings from online film review aggregators like Rotten Tomatoes and Metacritic averaging around 65%. Even Hollywood heavyweights like Quentin Tarantino have gushed over the film, calling it the epic of the year. Yet for all its breathtaking chases and gratuitous gore, I expected much more from the director of movies as powerful and moving as The Passion of the Christ. In fact, I feel the movie falls flat due to its oversimplified premise of pitting ‘bad natives’ against ‘good natives’. Gibson contrasts two conventional “native” tropes – that of the violent, brutal savage (the Maya), and the noble “eco-native” (Jaguar Paw and his forest dwellers). The forest natives are depicted as the innocent, gentle victims of the Maya, who practise slavery and human sacrifice, and live in an opulent, wasteful society of excess. Yet such portrayals are disappointingly simplistic, and rely too heavily at times on (largely Anglo-American) cultural stereotypes. The Maya are blood-thirsty monsters with hideous piercings and masks; the lead antagonist in the film, Zero Wolf (and what a name! ), even sports a stylish shoulder-plate of human jawbones. There is never really much of an attempt to examine why or how the Maya came to be sophisticated enough to build great pyramids, or develop into such an organised and successful civilisation. Hence we are made to simply accept as a given the facile dichotomy of Maya BAD, forest dwellers GOOD. Character development is kept to a bare minimum (perhaps that would have been an obstacle in adventure chase sequences), and we just feel whatever emotion Gibson would like of us in a given moment – whether it is fear, resignation, anger, sadness or relief. Moments of moral ambiguity come few and far between; they are infinitesimal compared to the movie’s breakneck pace. If you’d wanted a moral, emotional, historical or intellectual introspection on the sad state of our modern societies, like the film’s grand and portentous posters suggest, you’d be watching the wrong movie. Instead, we get gory heaps of blood and visceral violence. Forget the ambiguities. Drop your pretences. If you wanted thought-provoking you would read a book, or watch an indie flick. You came to be entertained, and this is what Apocalypto excels at. First we watch, disgusted, yet strangely fascinated, as the Maya decimate Jaguar Paw’s tribe, killing any who would deign to resist, and enslaving those who do not. Children are ripped from their mothers; mothers are clubbed to death; fathers have their throats slit; entire families are wiped out. Those that remain are later taken, smeared in bright blue for religious sacrifice, and then have their hearts casually ripped out while they are still alive. With the gods appeased, the surviving captives are used for blood-sport, to be hunted, speared and bludgeoned like wild game. The audience watches – horrified, mortified, but unable to look away. There is blood, plenty of blood. Why don’t we look away? Why don’t we look away? What Gibson offers us is a glimpse, a tantalising possibility of how things could have been long ago –the real-life Maya were indeed, though ahead of their time, violent and ruthless in war and religion. We witness as vividly as filmmaking technology allows the brutality of not only past civilisations, but of the darkness inside all of us. I watch Apocalypto and can’t help but think of all the atrocities to come in the centuries beyond the collapse of the Maya empire: first the arrival of the Spanish, and then much later, more pertinently, the violent wars of the 20th century – the mindless, cyclical slaughter of innocents Gibson is no doubt alluding to. While this is fiction far removed from our time and cultures, about barely-clothed tribes killing each other, no doubt it is a dark mirror held to our baser natures. What Gibson lacks in character development he makes up for in the uncomfortable, disturbing questions he raises about the human psyche. Watching the nonchalant violence of Apocalypto, we wonder if somewhere deep inside there is a part of us that is troublingly excited. After a while, we stop pointing and laughing at the ‘barbaric, uncivilised savages’ in this movie. We just watch, unsettled by how we are already anticipating the next act of unspeakable violence Gibson will spring on us. 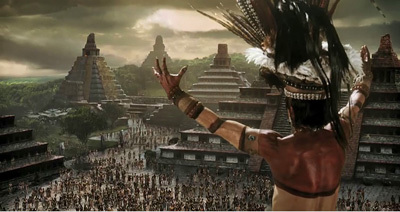 Apocalypto is a movie of absolutes – good and bad; forest and urban; violence and peace. The audience is told in no uncertain terms what they should feel towards certain characters and issues. Yet it is far from a stupid show about naked savages. Its violence speaks to a side of us we would rather hide away and not acknowledge. For a while, in revelling in Jaguar Paw’s sorrows and violent victories over his Maya oppressors, we put aside our civilised hides; we dance uninhibited in the darker, baser aspects of our natures. Gibson reminds us we are not the clean, cultured pinnacles of civilisation we style ourselves to be; somewhere inside there is still inherent, bloody savagery waiting to be sated or unleashed. Why don’t we look away? Good article, Ruizhi. I agree that we all inherit what we might think of as an essentially sinful and barbaric nature. What differentiates a human from an animal is that we have SOMEHOW developed the will and capacity to either consciously or unconsciously decide on the morality of our actions based on certain duties or rights (which we have defined for ourselves) and/or the consequences. While we may pretentiously label ourselves of higher moral and ethical standing than the Maya a-holes, we wouldn’t have been much different had we been living with the same background and situations, and thus the same philosophy of life (or the lack thereof) of the barbaric man, who succumbs to his natural desires. So unfortunately, we don’t want to look away.